Our April Showers from Tuesday’s Featured Friend, Just You and Me, brings us some May Flowers with Today’s Featured Friend, Planting a Rainbow. With so many wonderful flower books for kids, Ehlert’s is my pick because children ages toddler to ten (and even adults) can enjoy the book at different levels. 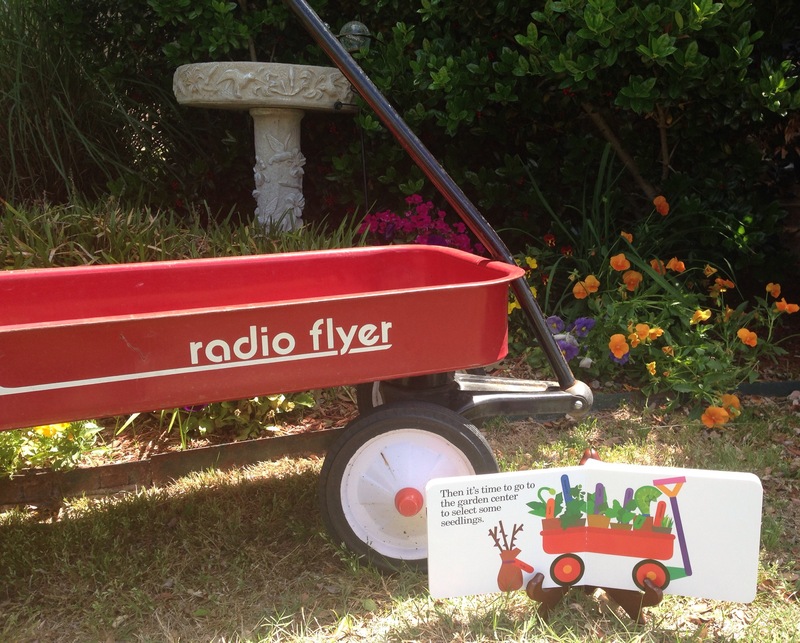 She begins her book with “Mom and I” planting bulbs in the fall, and moves through the seasons of winter, spring, then finally summer by illustrating and labeling the bulbs, seeds, sprouts, seedlings, and plants with pictures and colors that captivate us. In the middle of book, she includes a creative flip chart with each color of the rainbow and the flowers that correlate. For example, on her orange flowers page, she shows an orange tulip, zinnia, tiger lily, and poppy; the yellow blooms page features a yellow daisy, marigold, and daffodils. Toddlers can learn their colors. 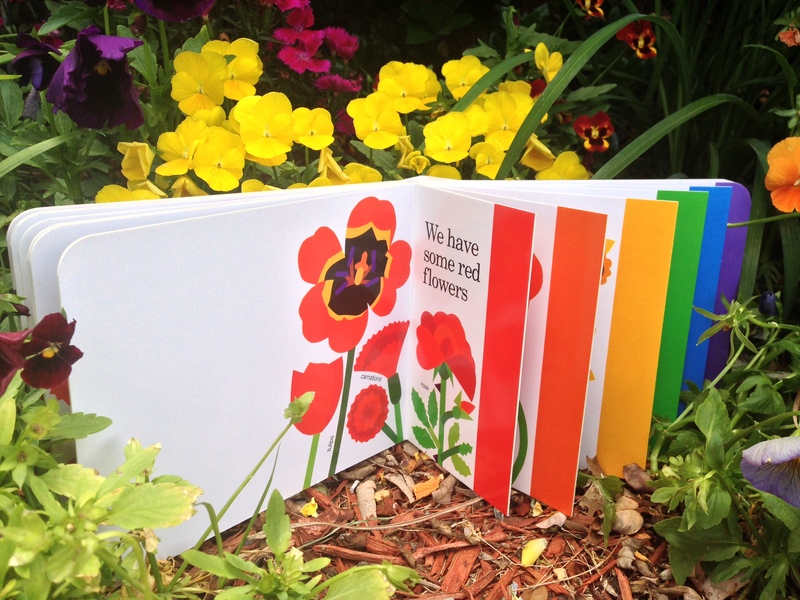 Pre-School kids can learn the colors of the rainbow & their seasons. 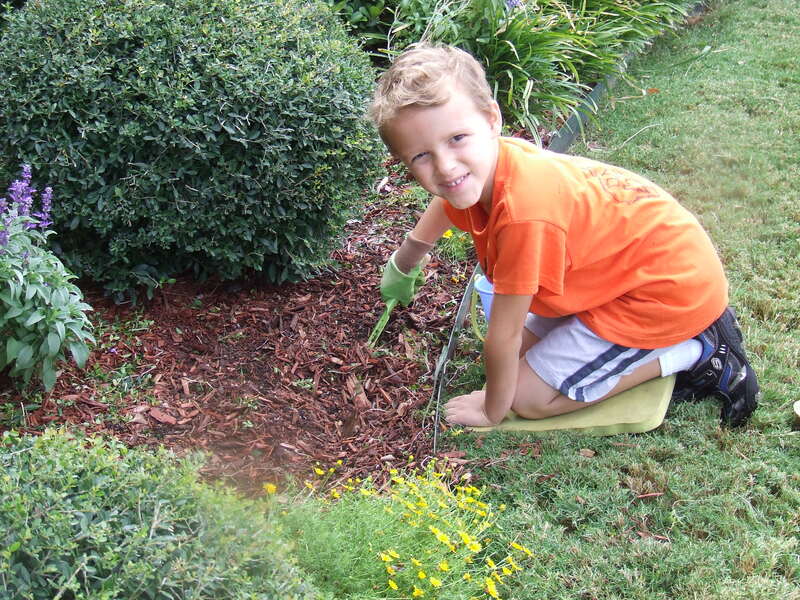 Kindergarten kids and up can start their own garden, even if it’s a plant in a pot! Adults can learn the names of the flowers and appreciate the art. Honestly, I can say that I discovered gardening during one of the dreariest, most painful times of my life. Four years ago, shortly after we purchased our first home, my mother moved in with us as she was battling cancer and needed our help. 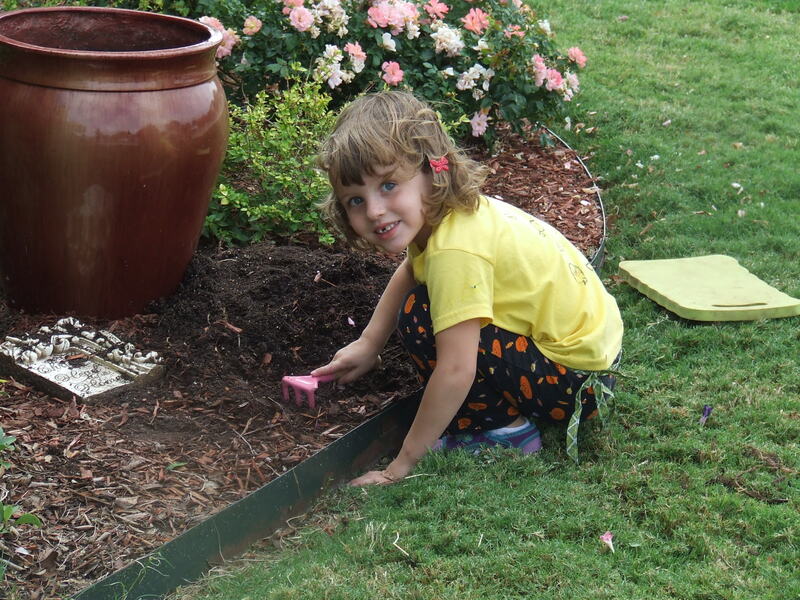 During this sad season, my kids (ages four and two) and I planted our very first flower garden in our front yard. The picture of “death” inside our home and “life” outside was striking. Although during this trial, I definitely didn’t have this “happy view” described in the lyrics of this song, if our family would not have taken time to see beauty in the midst of such a storm, we would have lost hope. Gardening is a picture of hope. We plant the seed, water it, wait, and hope it will produce the bloom. Such are the storms in our lives. We experience pain, weep, persevere, begin to see beauty again and from this process, we grow. And, just as weeds have to be plucked out of the garden regularly so they don’t choke out the blooms, so must our bitterness, resentment (or whatever it is that sticks it’s ugly head up) be plucked from our lives so they don’t choke our joy. We have hope. (Psalm 126:6). You too may need a plant on your porch, a flower in your front yard, or a rose bush in your back yard to help you to see a rainbow during a storm. 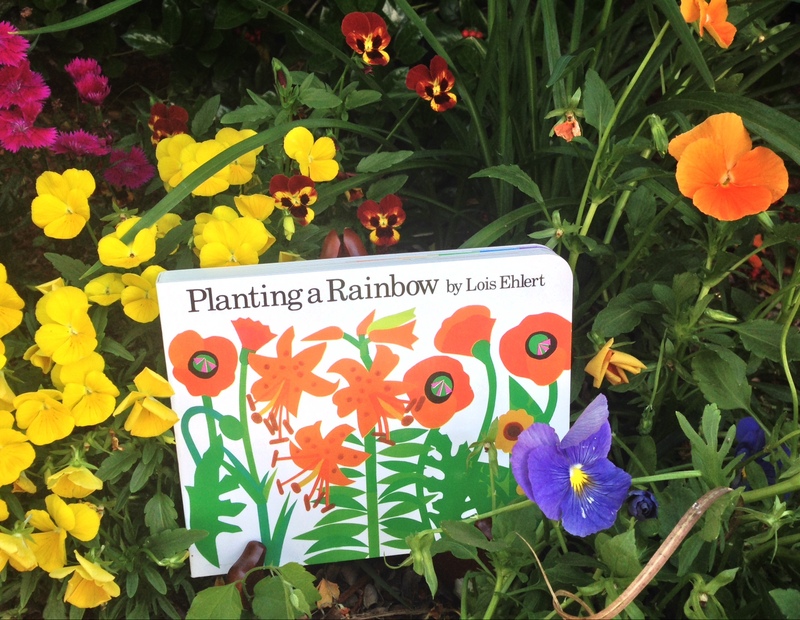 This entry was posted in garden, spring and tagged colors of the rainbow, death, gardening, hope, Lois Ehlert, names of flowers, names of plants, Planting a Rainbow, seasons, storms of life. Bookmark the permalink. For those of us in a painful season of life, this is a great reminder!! Sounds like a great little book…just for my old self even! I wanted to share with you my “love garden” story. (I may have done this before, but I don’t think so). When my husband had cancer and was not expected to live and going through treatment; he was often home alone most of the day as I was working and the children were in school. He was very, very weak and the likelihood of him dying soon was looming. He decided to plant a rose garden for me (I had casually mentioned in previous years that I sure would like to have some roses in the yard). He went out every day and began to dig a large round circle literally on his knees…pausing often to just rest. He did this for months and I begged him to stop and not sap the little strength he had left on this; but he did what he wanted. Eventually he had it finished with eight rose bushes of various colors planted there: absolutely stunning when they bloomed. I was humbled by his deep love to give all of his strength to do something for me that I had wanted. Each year as these roses bloom, we rejoice (yes “WE”….he recovered from his cancer in what his doctors call a miracle) in the goodness of our Great Lord and Savior. 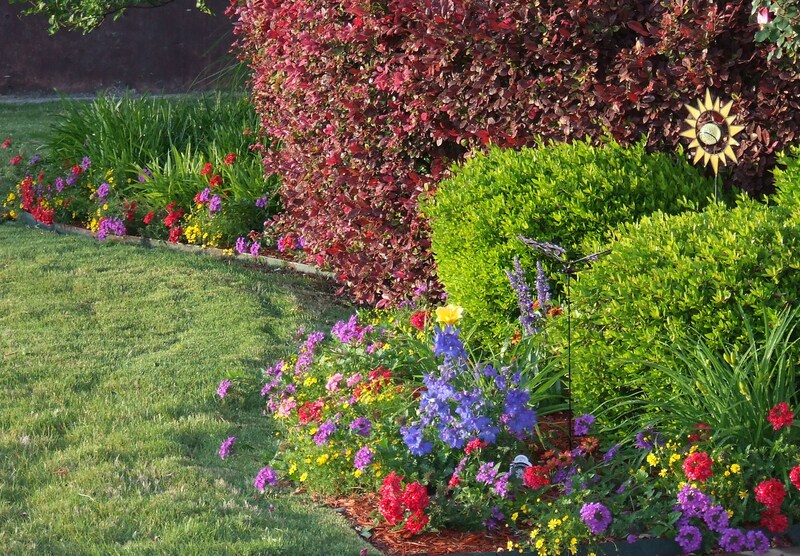 As you know, gardens are wonderful …every spring as the plants bloom in all colors, we praise God for His beautiful creation and for HIS great care for us as we too are part of His Garden. One day, we will be a part of this in ALL of its glory; but for now we can only catch glimpses each spring as we see new life come and beauty abounds. Thank you Terri for sharing this amazing story. How fitting. Thank you, Terry. Beautiful thoughts and pictures come to mind. Lovely, Angela! Your determination to cling to hope and seek beauty is a testament to the faith legacy your mother left you; what a rich legacy indeed! How proud she would be that you’re vibrantly sharing that faith with your children and with so many others! Thank you Jennifer. Mom, and her perseverance & laughter, is my inspiration. Angela, what a beautiful post. Thank you for sharing your experience, and I am so deeply sorry for the loss of your mother. God bless you, my friend!! Angela, thank you for sharing this personal journal with me. I miss your mom and her wisdoms. You know this is no better timing to receive this journal in the midst of coping the loss of my 29-year-old niece, Evelyn. Whenever I see rainbow, I see my husband. When Gare’ was in his final days, he used rainbow as a symbol to represent hope, happiness and positive attitude in life. Now when I see rainbow, I also see Evelyn in addition to seeing Gare’ with their big smiles looking down. Because I have terrible pollen allergy, I cannot do gardening. However, I would buy some beautiful flower plants each summer and fall to make me feel the way I feel when I see rainbow.